In my “old” baking life, I would always love the Spritz cookies at Christmas time. I didn’t like buying them, but very much enjoyed baking them. I had not made them the past couple of years. Between the palm sugar making them beige and the fact that I hadn’t transferred over my recipe to being allergy free, I hadn’t made them. With the discovery, and experimenting with Xylitol, I am much happier. Not only does xylitol work the same as regular sugar, is low on the glycemic index, but it is also white. In a small bowl, whisk together flour mix, xanthan gum, and sea salt; set aside. In a medium bowl, beat margarine and sugar on medium until fluffy. Add in egg and extract, beat well. Beat in flour mixture until smooth. 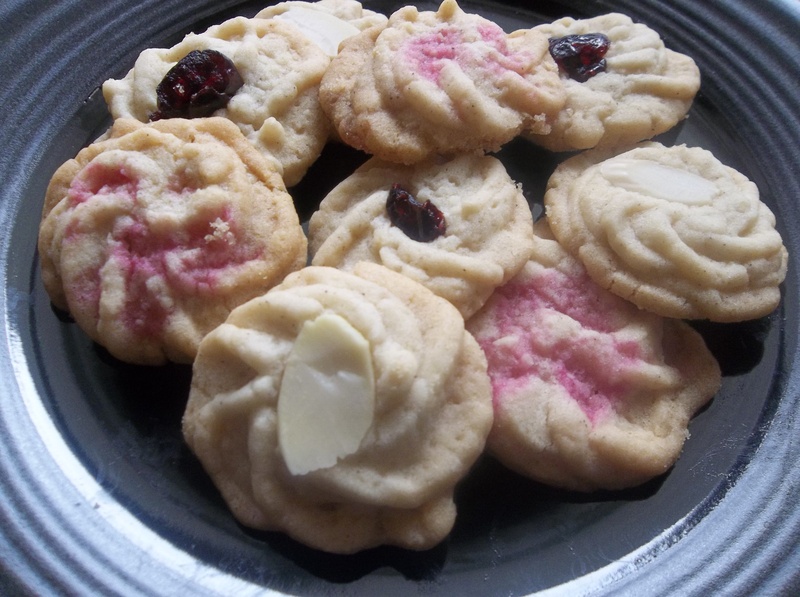 Fill cookie press with dough and add whichever disk you would like to make your shape. Press onto parchment paper lined cookie sheet. They don’t really spread so you can put your cookies relatively close together. Top with whatever decorations you’d like. 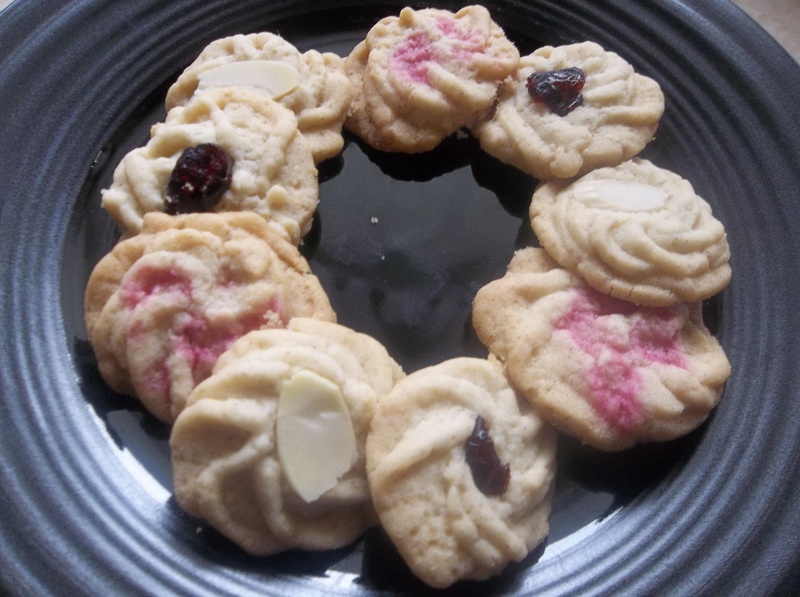 Coloured “sugar” (recipe below), dried raisins or cranberries, sliced almonds, pieces of chopped chocolate. 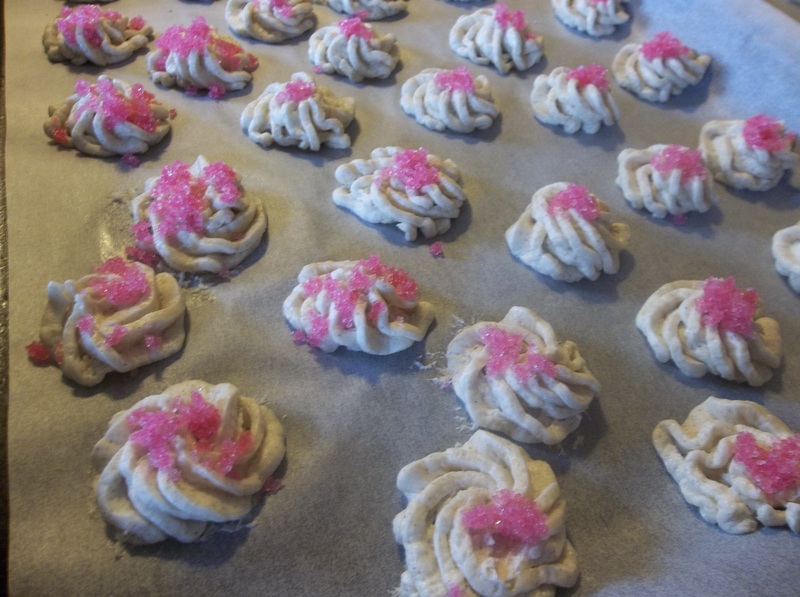 Bake cookies for 10-12 minutes or until edges are just barely turning golden. Makes approximately 5 dozen cookies. 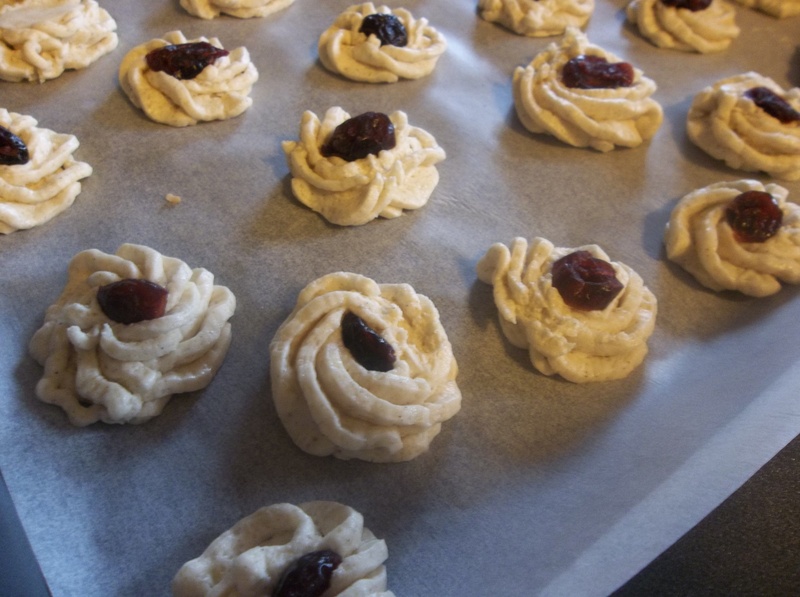 Most people store spritz cookies in an air tight container on the counter. I freeze mine and they still turn out great! Mix together and put onto a small pan. Let oven come to temperature then shut off. Put mixed sugar into warm oven and close door. Stir sugar every couple of minutes until dry. After oven is completely cool, take “coloured sugar” out and store in a sealed bag. * You can probably use beet juice to get a brighter red but I didn’t have any.